So, so good for the genre-savvy, but beginners be warned: Street Fighter V does nothing to help you grow as a player. What is it? The latest in Capcom’s almost three-decade-old fighting game series, and one with ambitions as an esport. My favourite moment so far in Street Fighter V was a mirror match: Ken against Ken. A Ken-off. Halfway through the first round my online opponent did a long, fancy combo I didn’t know existed. Had this been Street Fighter IV, I’d have gone on to lose, my confidence shot by the knowledge I was playing against someone with greater technical knowledge than me and the skill to put it into practice, in a game in which complexity was king. Instead, I won. Not with my fancy combos—though I’ve got a few—but with a cool head, the benefit of a couple of decades’ of experience, the knowledge of which buttons to press and when. That’s the best way to describe Street Fighter V, I think. Yes, there’s plenty of complex stuff going on, but at its core it is a celebration of what makes fighting games tick, and what makes them exciting. It is a battle of wits, of psychology, conditioning your opponent into doing what you want them to do, and punishing them severely when they do it. 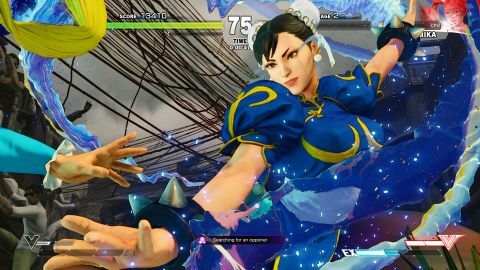 Mechanically, it’s perhaps the most accessible Street Fighter game there’s been since the SFII days. Special move commands have been simplified, with most performed with the classic, quarter-circle Hadouken or Hurricane Kick inputs, and only a handful of moves requiring half-circle, 360 or charge motions. Combo timings have been opened right up with a three-frame input buffer that brings even the mathematically hardest button combinations within reach of mere mortals like me: the frame data may say there’s only a one-frame window between two punches or kicks, but the buffer makes it four; it may not sound like a lot but, trust me, it is. The most transformative change involves the two medium attack buttons. Pressed simultaneously, these governed Street Fighter IV’s defining element, the Focus Attack—a beautifully designed but incredibly complex multi-tool that you could use to escape pressure or close space, to make your mistakes safe or continue a successful combo. It was brilliant, but utterly unfathomable to the novice player, a real stumbling block for the intermediate warrior and absolutely essential for those on the tournament scene. That’s no good for a game that Capcom hope will expand the fighting game audience exponentially. In its place is something that is every bit as smartly designed and brilliantly executed, but is much, much simpler to perform and understand. Mechanically, it’s perhaps the most accessible Street Fighter since the SFII days. Tap medium punch and medium kick in Street Fighter V, then, and you perform a V-Skill, a special move unique to every character in the game which typically either patches a hole, or is designed to support, that particular warrior’s playstyle. So Cammy has a spinning backfist that goes through fireballs, essential for a character that thrives when in close. The same applies to Zangief, who flexes his muscles and stomps slowly forward, able to absorb a single hit while he closes space. Ken has a speedy forward dash, to suit his aggressive style; Ryu has a Street Fighter III-style parry, to ensure the match is fought under his control, at his measured pace. Some V-Skills are modified by holding a direction on the stick—Necalli can alter the distance of his fireball-killing ground pound, Birdie can either eat a doughnut, throw a banana skin in front of him or roll a can along the ground—but all are simple to understand and execute, and more tightly woven into each character’s style and toolset than the system-wide Focus Attack. It’s remarkable, really. Runs at 60fps with everything maxed without a hitch, though a word of warning: turn off motion blur. The game looks a mess with it on, and it’s bundled up into a single setting, Post-Process Effects, along with stuff you actually want on like ambient occlusion. Nothing an INI tweak or two can’t fix, of course. Capcom aren’t done there, either. Replacing Street Fighter IV’s Ultra Combo is V-Trigger, governed by a meter that fills as you get hit (and use your V-Skill) and activated by pressing both heavy attacks. It’s not an Ultra-style cinematic move that does half a health bar’s worth of damage if it hits and leaves you open to absolute murder if it misses. For most of the cast, it’s a buff on a timer, increasing speed or damage output, or the properties of special moves: Cammy, for instance, gets a tremendous speed increase, and juggle properties on her specials. But others gain specific tools. Dhalsim gobs out a damaging carpet of flame, Nash can teleport out of the corner or behind you to extend a combo, and the poison-flinging F.A.N.G coats himself in purple venom for a while. Unlike Street Fighter IV’s all-or-nothing Ultra, you can’t just fling out a V-Trigger and hope it hits. You have to learn what it does, when best to activate it, and how best to use it once it’s up. Which is where Street Fighter V’s problems start to become apparent. Capcom has said an awful lot about its ambitions for the game, about its aspirations for it as an esport, about its accessibility. And, yes, it’s designed a game that is mechanically simpler than its predecessor. But that’s all relative, and while anyone who sunk a thousand hours into the Street Fighter IV series can identify, understand the reasoning for, and appreciate the changes Capcom has made, the new audience the company so craves need a little more help than that. And Capcom gives them nothing. The tutorial is an insult—to the player, the game, its genre and the word ‘insult’. Apparently all you need to know about is how to jump, perform the three strengths of attack, throw and block. Oh and here’s how to do Ryu’s V-Skill and V-Trigger. OK, bye! Fighting games have long struggled with tutorials, and Capcom has laboured more than most. But there are certainly enough good examples of how to effectively teach the player about fighting games—Arc System Works’ Blazblue and Guilty Gear Xrd, and LabZero’s brilliant Skullgirls tutorial in particular—that it’s unfathomable that a game with such big massmarket ambition could have launched with such a pathetic introduction. These games need a gentle on-ramp; instead, Capcom push you off a cliff. Still, it’s a graceful introduction to the singleplayer component as a whole, in a way, because there’s not very much of that here either. There is no classic arcade mode; indeed, there is no way to have a traditional best-of-three-rounds match against a CPU opponent. A cinematic story mode will arrive as a free update in June; in the meantime all you get is a series of ‘character prologues’ of two to four single-round fights per character against AI that just sits there and gets hit, interspersed with fully (and badly) voiced comic-book panels. Then there’s Survival mode, another succession of single-round fights against CPU foes that put up virtually no resistance until the final few rounds when the AI suddenly switches into Kill Everything mode. In between fights you can spend some of your acculumated score on health, damage or defence buffs, a nice idea scuppered by a random number generator that has an infuriating habit of offering you the lowest amount of health restoration when you’re down to a sliver and two rounds from the end. There’s a standard versus mode (with no vs CPU option, weirdly) and what is in fairness a feature-rich training mode, but for the single player that’s the lot. Series veterans couldn’t care less about that sort of stuff, of course: give them a training room, local versus and a busy online community and they’re set for the next couple of years. But those lured in by Capcom’s promise of this being a fun, accessible game are left in the dark by a game that simply doesn’t do anywhere near enough to explain either itself or the principles of its genre. You can tell straight away when you’re playing one of them, these poor saps who’ve mucked about in singleplayer mode and acquired what they don’t understand are bad, repetitive habits, their unsafe jump-ins, their hopeful Shoryukens. Obviously they need to be taught a lesson, but it’s one that should have already been taught by the game itself, rather than coming at the chastening hands of a more knowledgeable opponent. That’s not how you grow a community. Nor is launching with some fairly ruinous server issues. Street Fighter V is essentially always online (if you’re online to start with, anyway) since a lost connection to the server will boot you out of your current game mode (even local versus). Things have improved since a miserable launch day, but there are still matchmaking issues and when the connection’s bad it is really, really bad, Capcom’s new rollback netcode causing players to teleport all over the shop. Street Fighter V is two very different games. To the battle-hardened it is simply brilliant, stripping away much of the nonsense and complexity of its predecessor, with a cast of characters that each feel unique thanks to the V-systems. To the single player it is as convoluted and baffling as ever, and miserably light on content. There’s nothing wrong here that isn’t fixable, but Capcom need to act quickly before this ambitious, often brilliant game is forgotten by the beginner players Capcom say they want to bring on board. Zangief has excellent range on his attacks, meaning he’s less reliant on being up close. What did we say about his range? Just look at that. Dhalsim’s V-Trigger fire carpet is fantastic, and the perfect setup for teleport mixups. Pro-tip: Ryu’s medium Hurricane Kick gives better positioning, but you can follow up the light-kick version with his Critical Art. Chun can now do Lightning Legs in the air. Zangief can piledriver up there, too.